Once Foes, Are Beckerman And Jones The Key To USMNT Success? For what feels like ages, they've been pitted against each other: two men with vastly different backgrounds, bound together by the single spot they've battled over in the U.S. midfield. The 32-year-old from Maryland, who used to sign his childhood notes "USA #15," then went after that dream via the U.S. youth system and a long career in MLS. He's the steady, tenacious, and watchful presence in midfield, content to stay back, break up the opposing attack, make safe passes, and leave the glory to others. Kyle Beckerman is the national team's guard dog. The 32-year-old from Germany, born to an American father, and raised partly in the States but developed in Europe. He played in the German youth system, then turned his gaze toward America after a FIFA rule change made him eligible. Blessed with the trinity of size, speed, and strength, he's a tough-tackling, full-field threat whose volatility and penchant to roam excite and frustrate fans. Jermaine Jones is the national team's attack dog. 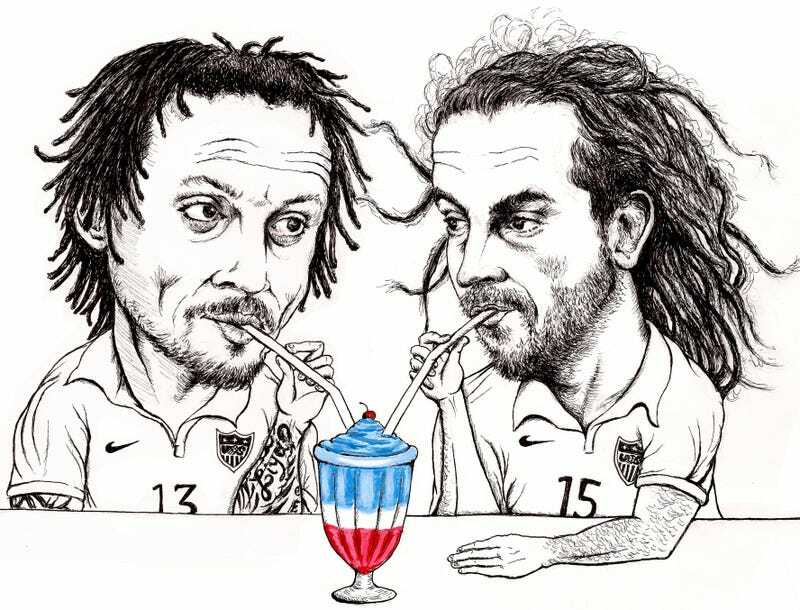 Like the sides of a two-headed coin—long, tangled dreadlocks on one side, short twists on the other—it long seemed that Beckerman and Jones could not land face-up on the field together. Through a combined 77 appearances leading up to June 7, Beckerman and Jones had played together for just 324 minutes. Their names were more often connected by an "or" than an "and." They had started together just once with Bradley in the lineup. But with a surprise tweak before a 2–1 tune-up win against Nigeria, U.S. coach Jurgen Klinsmann may have changed that. For the first time since a 2011 draw with Mexico—Klinsmann's first game in charge—he deployed Bradley, Beckerman, and Jones together, freeing all three to play their preferred midfield roles. After commenting days earlier that focusing on formations is "useless," he unleashed a departure from the 4–4–2 diamond and 4–2–3–1 that had become customary. In defense, a 4–3–2–1 "Christmas Tree" provided a compactness that had been lacking against Turkey. Beckerman sat in his customary holding role, flanked by Jones to his left and Alejandro Bedoya to his right, and his presence allowed his linemates to fly forward into the attack. At the other end, Bradley was partnered with forwards Clint Dempsey and Jozy Altidore to maximize his vision and creative skills. It worked, providing a solid defensive performance and several bright offensive moments. Bradley had room to run forward, and his shot in the 23rd minute marked one of the Yanks' first positive attacking sequences. He also notched an assist on Altidore's second goal and set up a close-range chance for Dempsey. Jones was sharp as well, teaming up with Bedoya and right back Fabian Johnson on the possession that led to Altidore's first strike. It was less about the formation than the personnel, and having Beckerman and Jones supporting Bradley together clearly paid off. "I saw a lot of work that they did, tremendous cleaning up all over the place," Klinsmann said in his post-match press conference. "We know Kyle, and that's his specialty, to protect his teammates and run endless miles for the team. Jermaine in that half position has more freedom to go forward so he can kind of switch back and forth with Michael Bradley, and he knows that there's someone behind him there, so 'If I lose the ball in my run, Kyle is going to clean up for me.' It worked out really well." Whether it will work at the World Cup is another matter, but the setup certainly enabled an organized defense and a variety of counter-attacking options with Jones, Bedoya, Johnson and left back DeMarcus Beasley making runs from deep positions. The addition of Beckerman means that the U.S. would play without a traditional left-sided attacker. Clint Dempsey spent much of the game pushed farther to the left than we're used to seeing him, the result of Bradley moving up the field. The shift also means that either Graham Zusi or Bedoya is likely to lose a starting role, but they or Mix Diskerud could provide solid reinforcements off the bench, with the option to move Bradley back to a holding spot if needed. Because the new approach clicked against a World Cup-bound opponent less than a week before the start of the tournament, it's likely to be seen again. And the linchpin of the whole system is the co-existence of Beckerman and Jones. "He has such a motor and he's so powerful," Beckerman said, referring to Jones in his typically laid-back manner. "He likes to drive and get into the attack. So if I have to sit in there and watch his back, it's all good, and I know he can cover a ton of ground." After months of competition for one spot, Jones and Beckerman have discovered that, all of a sudden, there might be two. Beckerman-or-Jones can become Beckerman-and-Jones, and that small change might just hold the key for U.S. success in Brazil. Mike McCall is a Web editor at Howler. Follow him on Twitter, @MikeMcCall.